Three photos, averaging about 2.5 x 4.25 inches each. As someone with a background in theater, I was delighted to come across the two photos on the left, which appear to be from a vintage amateur stage production. (I have no idea what the play might have been.) 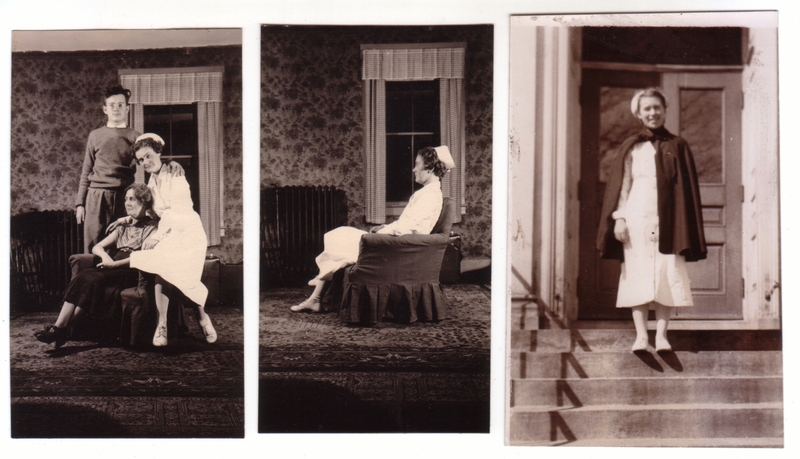 The woman playing the nurse appears in other snapshots that I have, including ones showing her lounging around for the camera in rather actorly poses, as if these snapshots taken in some living room were intended for publication in a fan magazine. It’s actually rather charming. The two above show her in action, treading the boards, which makes me happy. And just for good measure, even though it’s a bit blurry, I’m tossing in a photo of a real nurse, too. I love the cape! I know this makes me sound as though I am living in the past. However, I miss seeing nurses in white uniforms and starched caps. I was always fascinated by the different styles of caps. As I understand it, each school had their own design. I didn’t know about the different styles of caps for different schools, that’s interesting! While I’m sure we don’t want nurses to have to return to the challenges of the starched white uniforms, I can relate to the attraction to the uniforms in general. There’s something about a sharp, clean uniform on, say, a nurse, or flight attendant, or bellboy, that gives an extra snap to their appearance and an added air of authority. 5 Nov 2011 at 12:08 pm M.O. Matt, I hope you post more photos of the actor! I’m especially curious about the ones that look like fan magazine photos!